Freelance Traveller is available as a free PDF magazine, published approximately monthly January 2010 through December 2015, bimonthly beginning January 2016, and with an introductory issue November 2009. You can download the current issue in either ANSI A (US Letter) or ISO A4 format. If your computer is equipped with PDF browser plug-ins, the magazine may open up in your browser; you can avoid this by clicking on the link with the secondary mouse button (Mac users with one-button mice use Control-click) and selecting "Save Link As..." or "Save Target As...". You can also download past issues as new issues become available, or find specific articles from those issues on our web site. Links to past issues will appear below. The December issue each year contains a consolidated listing of all articles published during that year. 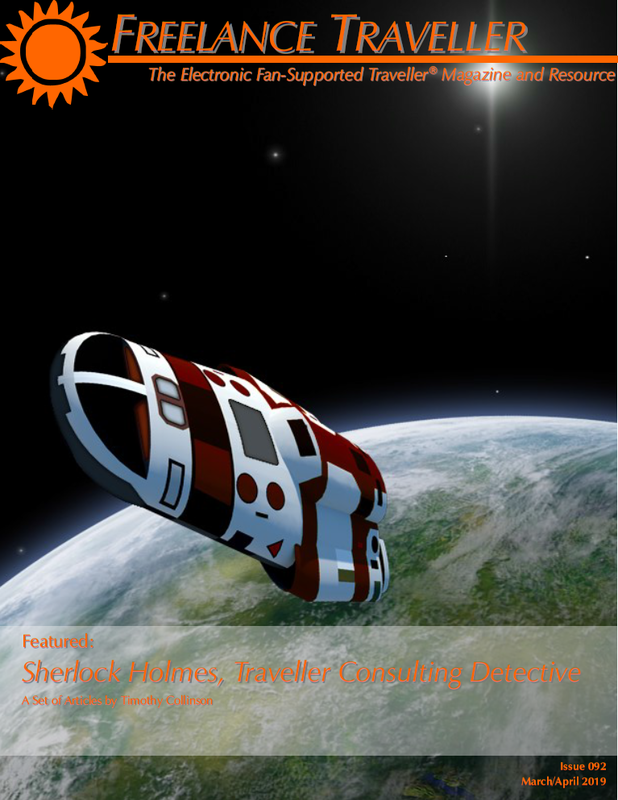 You can also download a complete consolidated listing of the entire Freelance Traveller magazine run. This consolidated listing will be updated with each issue. PDF files require Adobe Reader or equivalent software. Adobe Reader can be obtained free of charge from Adobe Corp., http://www.adobe.com.